Personal home and mobile Wi-Fi networks are ubiquitous in our day and age. Many people who receive their routers from internet service providers (ISPs) simply use the default password and settings already associated with their routers. But this can spell trouble, as most Rainbow Tables (tables used by hackers to automatically generate passwords) come with millions of combinations (produced by basic algorithms) that may easily predict your password. You’ll want to come up with a random Wi-Fi name, or get creative. Either way, all is not lost as there are some basic steps to ensure your Wi-Fi security is in good health. As you change your Wi-Fi network name, be sure to also change your Wi-Fi network password. As lifewire notes, “Longer passwords are better because the Rainbow Tables that are used to crack passwords aren’t practical after you exceed a certain length of password due to storage limitations.” For this reason, it is recommended that passwords are at least 16 characters long. Consider using Norton Antivirus’s password generator, as it avoids many of the common mistakes in creating a password. Unless your router is a few years’ old already, this is most likely something you won’t need to worry about. Most older routers use WEP security, which sends all packets of data using the same encryption method. This means that if somebody is eavesdropping on your connection, and attempting to crack the data encryption, they just need to figure out the encryption for one packet, and everything you send can be read. WPA2 (PSK) is the most secure for personal routers, as it ramps up encryption by using a 64-character hexadecimal character set, scrambling the encryption key, and verifying that data hasn’t been manipulated or altered during data transfer. If you have WPA2, you will want to enable it as soon as possible. Most likely, especially if your router is new, WPA2 will already be operative. And, if you do have a new router and it uses WPS (Wi-Fi Protected Setup) which is supposed to make Wi-Fi setup quicker, be sure to disable that feature, as it contains known security risks. The great thing about Wi-Fi routers today is they come with advanced options accessible through a simple admin login screen. From this screen, you can generally track which devices are connected to your router, remove and add devices, allocate router resources by prioritizing certain connected devices, change your Wi-Fi password, and, mostly, anything else you’d want to customize with your router. You will want to change this default admin login, however, for the same reasons you will want to change the default Wi-Fi name and password. Websites like RouterPasswords.com actually store admin login credentials based on router device model. MakeUseOf.com provides a simple guide for changing Admin credentials. You’ll want to do this as soon as possible, and, of course, if the feature is available, disable “Admin via Wireless.” If ever you need to adjust settings on your router, it is best to use a wired connection. As security vulnerabilities are discovered and patched, ISPs release these patches in the form of router updates every once in a while. When you get a router, be sure to ask your ISP if the router will automatically update or if you have to manually download these updates and install them on the router yourself. If so, they can give you specific directions to do this. And, don’t worry, it sounds more complicated than it is. For being one of the most important security-improvement activities you can do, it only takes about one to two minutes, and generally involves just a few clicks of the mouse. Lastly, you’ll want to ensure your router’s firewall is activated. Firewalls are like castle walls, shielding and protecting everything within the network from attacks outside. Firewalls can take many different forms, from a hardware component in your router itself or specialized code in the software. The main way firewalls protect your network is by making the network invisible to hackers. Another way it protects your network is by comparing all incoming packets of data against a database of information, accepting the data packets only if they pass a certain test. To ensure your firewall is working, you can test it by following LifeWire’s guide. Just be sure your firewall is activated and running (if you have “stealth mode” turn this on also). 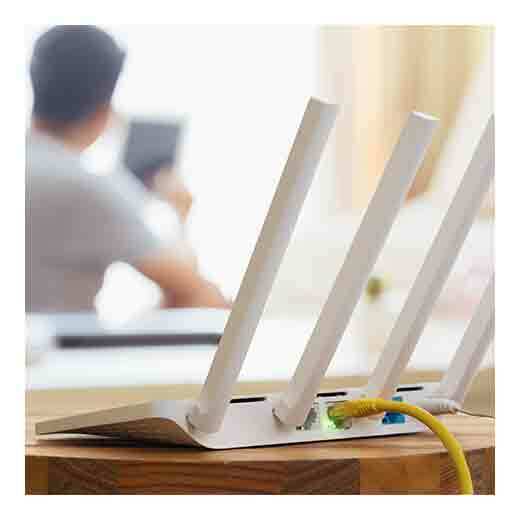 If you just recently purchased Wi-Fi, are in the process of moving, or are just updating your router, now is the perfect time to ensure your wireless network is secure. Although times of transition are perhaps the most convenient to establish and verify network security, don’t wait to do so. As more and more transactions are occurring online, and sensitive information is passed along to different websites daily, it’s important that you’re using a secure network. Follow these tips to ensure your wireless network is secure. The post 5 Tips for Keeping Your Wi-Fi Network Secure appeared first on Apartments For Us.